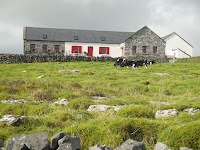 Doolin was probably the smallest town we stayed in. You truly could not blink or you'd miss it. 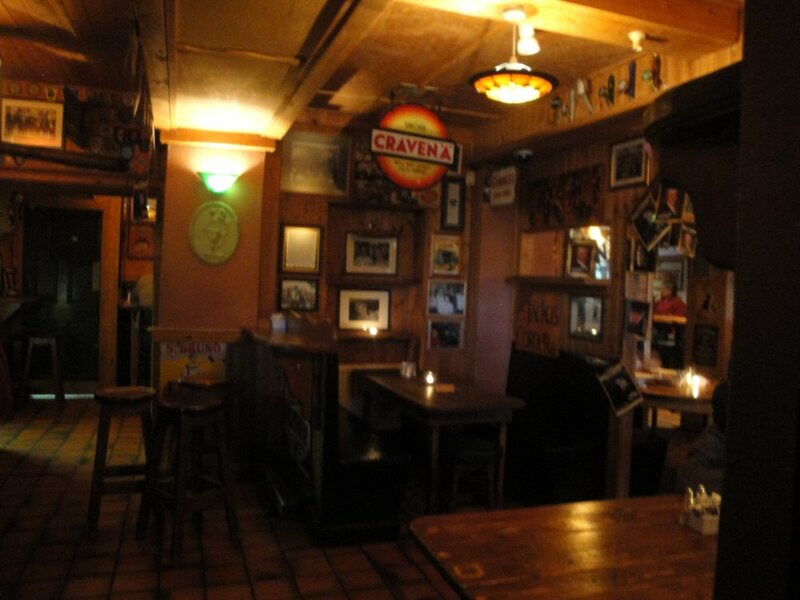 Once we checked in at our B&B, we headed off to the two pubs that were recommended by our host for dinner. One, O'Conners, was obviously full of people since there were a couple of tourist buses parked nearby. We discovered later that it was because the traditional Irish musicians were playing through the dinner hours. Usually the pubs didn't start live music until 9:30 p.m. or later. Undaunted, we turned around and headed the other direction and up a little farther on the hillside to McGann's. We were rewarded with what I would call a true town pub as you might imagine it. An all wood interior with heavy wooden tables and stools rather than chairs. We ordered at the bar and our food was delivered to us at a table. I had the biggest hamburger I've seen in quite a while and the French fries we re quality. In Ireland, they fry them the old fashioned way--real lard. 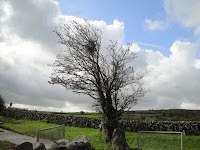 After a great breakfast at our B&B, we were on the road again and headed for the area known as the Burren. It literally means "the rocky place" and that it was. But I'm getting ahead of myself. 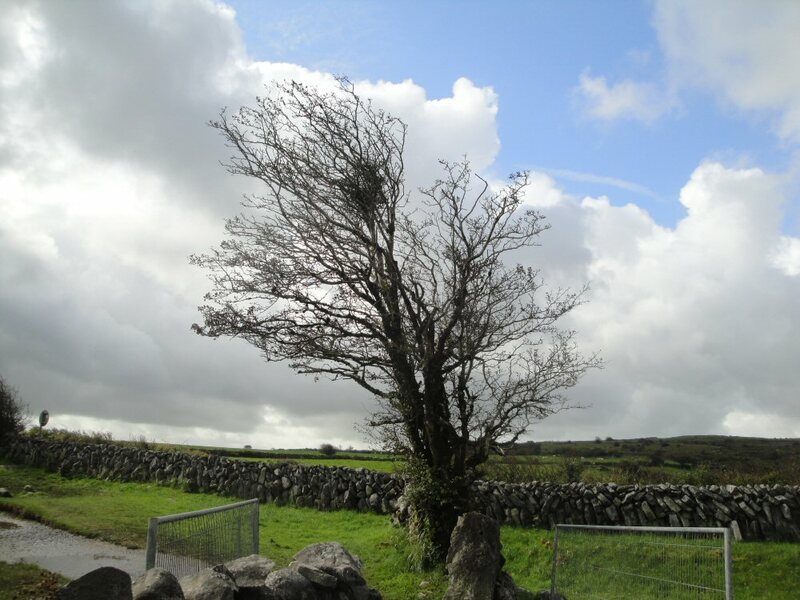 Our first stop was at the "gateway to the Burren," Kilfenora. 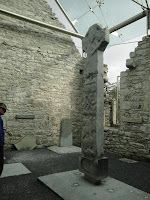 The site to see here was the Kilfenora Cathedral that dates back to 1189. While the cathedral is actually in ruins, it still holds several high crosses (standing crosses with a circle) the most famous of which is the Doorty Cross because of its carving of a bishop on it. 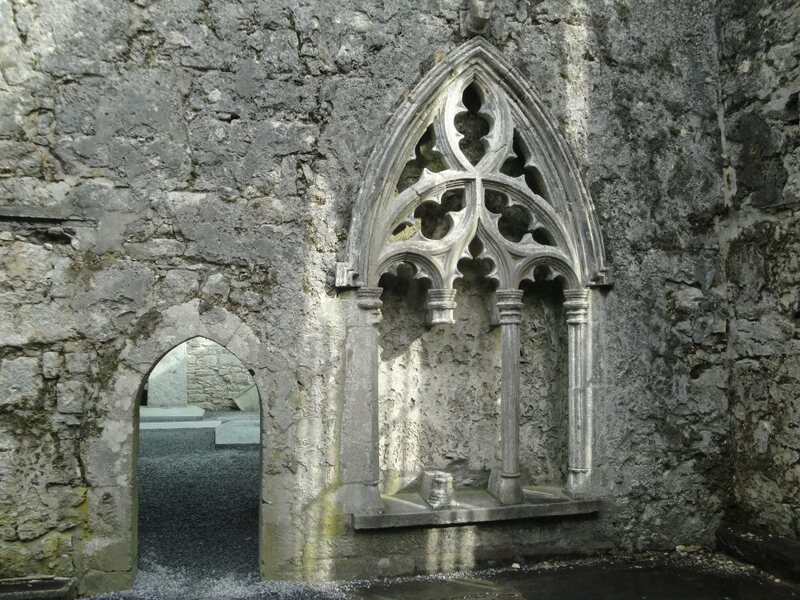 Apparently during the potato famine in order for the very poor church to survive, the Pope declared himself bishop of the area. Next up was the 15th century Leamaneh Castle. 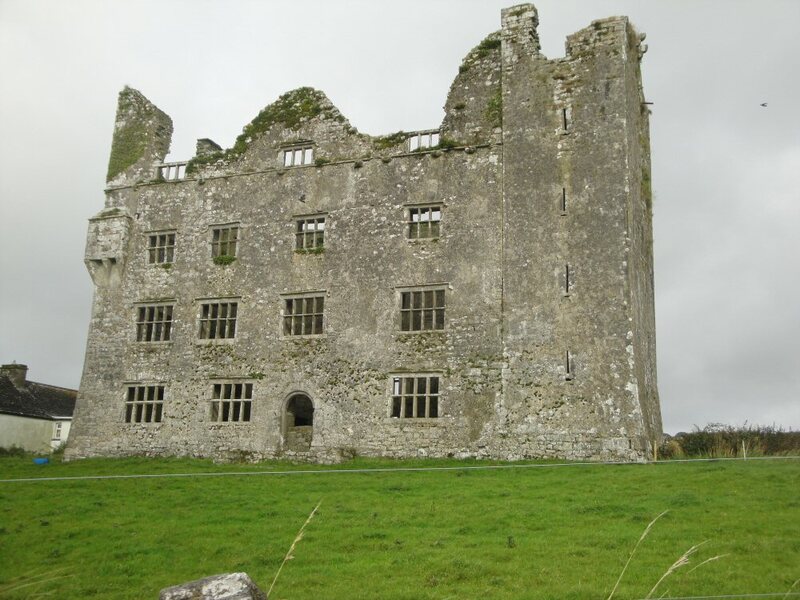 Only a shell now at one time it was a fortified tower house. As less fortification was needed, the house was expanded and the windows were enlarged. It was a bit eerie to se e large blackbirds flying around inside. All it needed was a scraggly old tree outside, a little twilight, and a moon rising behind it and, well, you get the picture. Lots of stories of the owners are told here at this site if you're interested. We pulled into the parking area to see another ring fort and I have to confess, I was up to my ears in ring forts and their history. Just inside the pretty little cottage entrance to the fort was a very inviting cafe with tea and scones. I opted out of the ring fort excursion and had some quiet time enjoying a scone w ith whipped cream and jam. 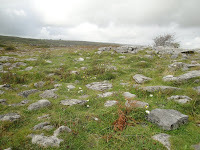 Between the fort and our next stop the Poulnabrone we drove through the Burren and marveled at the landscape. It was no wonder there was not much farming in this area. It would have been near impossible to remove that many stones to make the land farmable. 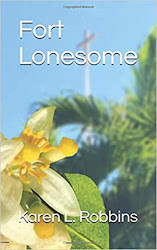 For as far as the eye could see there were rolling hills and mountains of stone with a little greenery tossed in between. 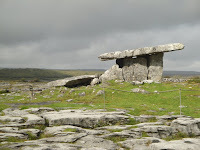 The Poulnabrone or "p ortal tomb" we stopped to see was truly in the middle of nowhere. 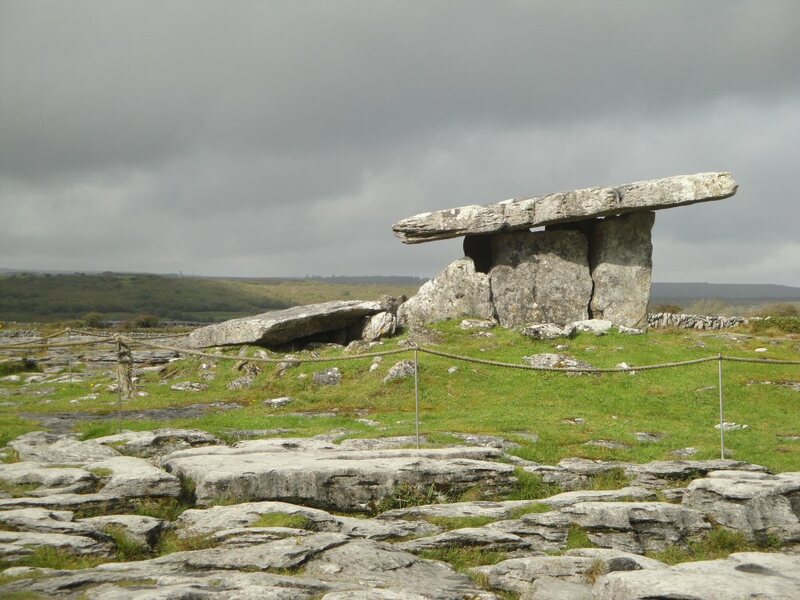 It is said to be 5,000 years old and archaeologists discovered remains of more than 30 people there. 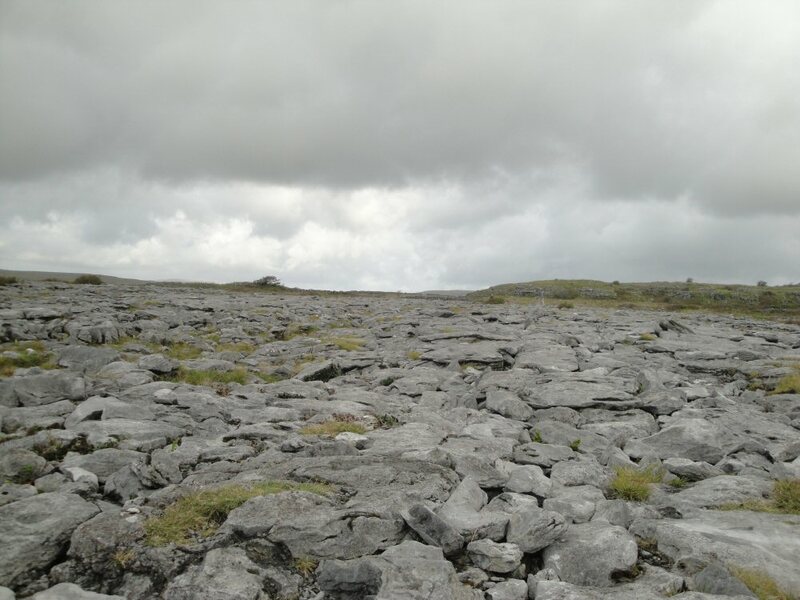 While the tomb is interesting it is far more interesting to wander over the limestone formations there. 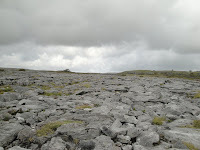 Crevices in the limestone formed by water erosion are called Grikes and the blocks that are formed are called Clints. 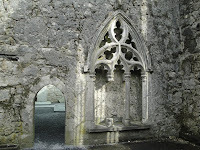 Here and there you will find a hole in the limestone formed by rainwater dissolving the limestone. These are call Kamenitza and look like na ture's flower pots. A little soil forms in the bottom, a seed falls, and with a little coaxing from nature, you have a blooming plant. 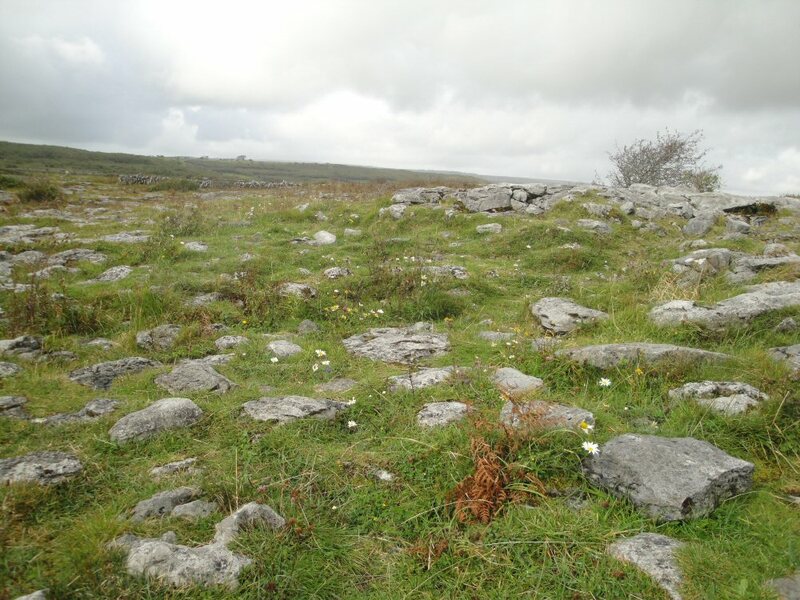 The Burren is said to be at its best when the wildflowers are in bloom. 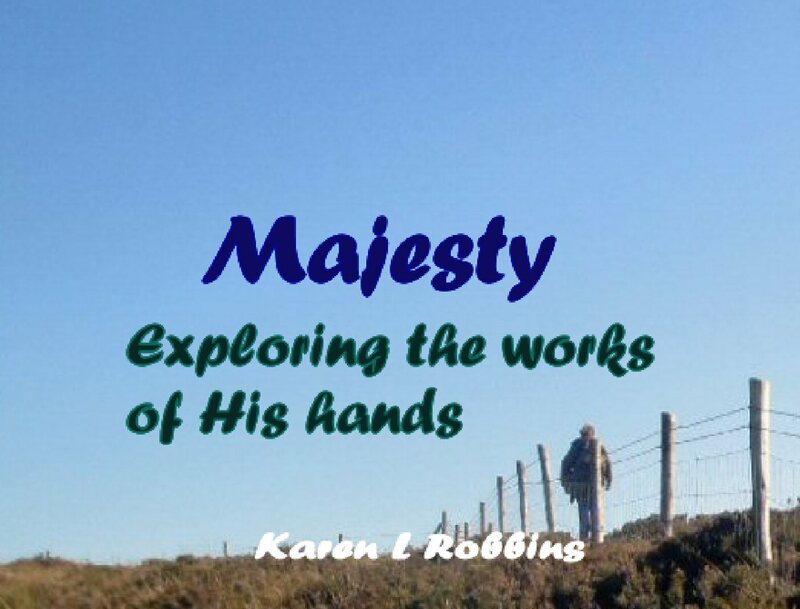 While we found a few, I can imagine that at the right time of year it must truly be spectacular. Wonder exactly when that is? Time for research. My bucket list is growing again. It is amazing, thanks! Would love to see it in bloom.